Burger de Ville is a family owned business. 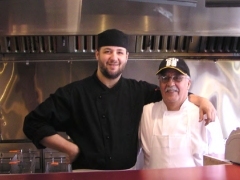 The father and son team of Mohamed and Reda Wahba believe in serving their customers the best quality food at affordable prices, in a nice, family atmosphere. We use only 100% Canadian beef, always fresh, never frozen ! Our steak is graded AAA, and properly aged. Our dressings, sauces, and other ingredients are all made in-house, and our soups are made fresh daily. Our hand-cut fries are cooked in peanut oil. 0% cholesterol. Come in and enjoy relaxed, casual dining in a family atmosphere - or - give us a call with your take-out order. To see what the critics think, check out our Reviews section. Join us on Facebook to see what others thought of their experience.